Make Blackboard Yours. Customize your My Courses module by organizing your courses by term or any order you prefer, adding links to courses on other systems or choosing additional course information to display. NOTE: Your institution has the ability to disable user to customization options. 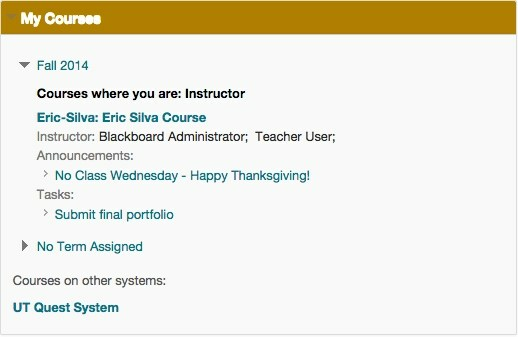 Hover your mouse over the right corner of the My Courses module header and click the gear icon. Group by Term: This option will organize your courses by term. Show Term: When selected this term will be shown. Reorder: Click the icon to manually rearrange your courses. Use the icon to drag courses to their new location. Course Name: Unchecking this option will hide the course from the module. Course ID: This option will display the Course ID before the course name. Instructors: This option will display all course instructors. Announcements: This option will display course announcements below the course name. Tasks: This option will display course tasks below the course name. Course # Name and URL: Enter your course name and URL.